Kansas DOT general highway and transportation map for Kansas counties. Yes that's the marker. I'm slowly making SVG versions of all the markers for Wikimedia Commons (Wikipedia). I had this one done. Here's a JPEG version. I don't know any history on the highway, but can always look up the route on various auto trail maps. As the name implies, it was transcontinental. As I recall, for a time at least it came to San Diego. I think that changed later to LA. The next four maps are from 1915–1917. One source I've read said that Torrey Pines Road was paved in 1915. How far north that paving went is unknown. If it went all the way to La Jolla Junction, then it's possible that Torrey Pines Road became favored over La Jolla Shores Drive and the Biological Grade (aka La Jolla Grade). Some of the maps below, especially the Goodrich map, seem to imply that the grade had been bypassed. The first map below is the second map I consider as a standard for what the ACSC considered El Camino Real. It is ACSC strip map No. 212, and is part of a second series of three maps entitled "Automobile Tour of the Famous Missions in California on El Camino Real." At this time (before about 1919), the strip maps were still dated. This map has a 1915 copyright date. These maps are also featured in an early ACSC highway guide called California Mission's Tour, dated April 10, 1915. Click for a larger image. NOTES: Since this is a large scale map showing the route from San Diego all the way to L.A., there isn't a lot of detail. However, the road north from La Jolla seems to go a bit farther east, and there is no indication of the La Jolla Grade as their is for the Torrey Pines Grade. It may just be a lack of detail, but the route bears a resemblance to the next Goodrich map below. No Rose Canyon route is shown. 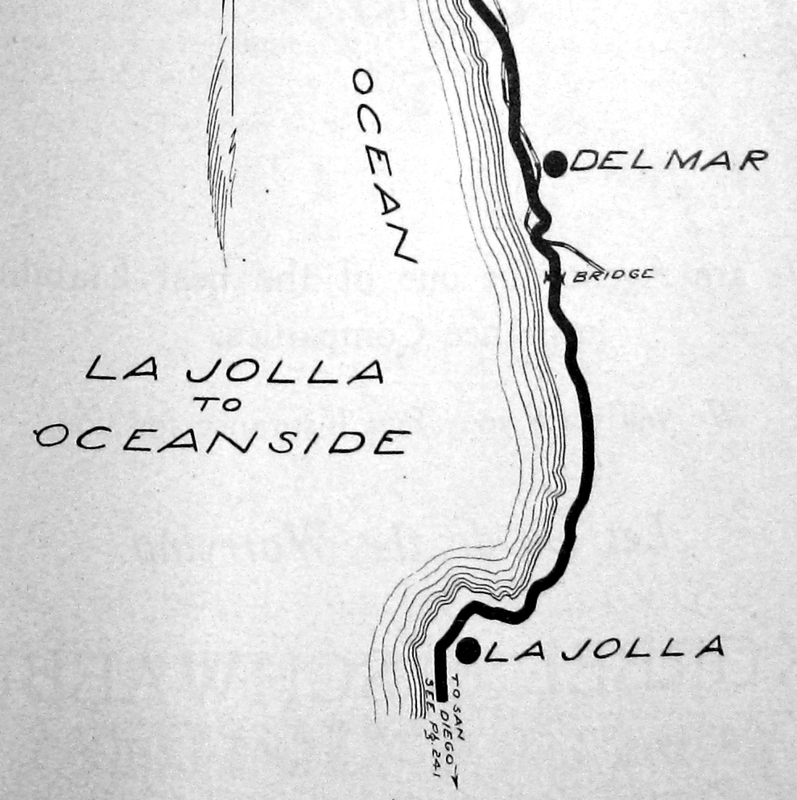 The map below is from the 1916 Southern California Goodrich Route Book. Click for larger image. NOTES: Goodrich road signs existed everywhere a "G" is shown on the map.... As mentioned above, the main thing to note here is that the road north from La Jolla seems to be on Torrey Pines Road rather than on La Jolla Shores Drive. The shape of the road, and its position, is nearly identical to the road shown on the topographic maps, as well as most of the road as it exists today. There is definitely no indication of the La Jolla Grade, which exists much closer to the coast. The Rose Canyon road is shown with a medium bold line, indicating a secondary route. It is shown climbing Gilman Drive to La Jolla Junction. The road northeast to Sorrento, and the rest of Sorrento Valley Road is shown, but as a thin line. This map is so close to the road patterns in the topographic maps, that I believe the cartographer used topo maps as a primary resource. One oddity here is the Torrey Pines grade, which still seems to show the old eastward path at the north end of the grade, and the early meeting with Sorrento Valley/Carmel Valley Road. The third map is a small clip from the 1917 ACSC State of California map. 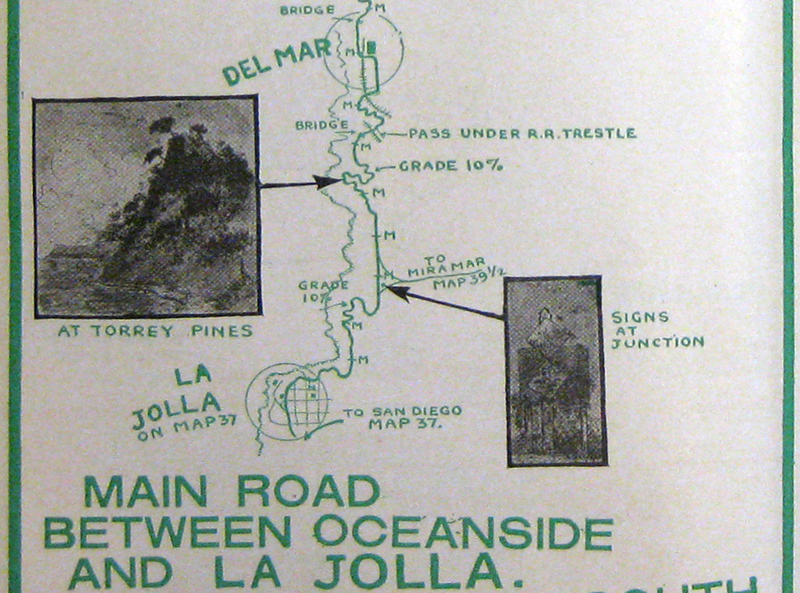 NOTES: This map also seems to show the same road out of La Jolla as the previous two maps. The Torrey Pines Grade is shown, but the La Jolla Grade is not. The Rose Canyon road is shown, and it seems to head straight north all the way to Sorrento. However, in reality, as stated above, it would have to climb a grade (probably Gilman Drive), and come to at least a quarter mile east of La Jolla Junction. There is no canyon straight north to Sorrento. The last map is the odd man out. This is from Locke's Good Road Maps of Local and Transcontinental Automobile Routes. This map has a 1917 date, and was first published in the 1917 edition, but my copy is the 1919 edition. Locke's maps have notoriously variable scales, even on the same map. Compass orientations also vary on the same map. However, curves, railroad crossings, stream crossings, etc. are generally indicated where they are often not on other maps. 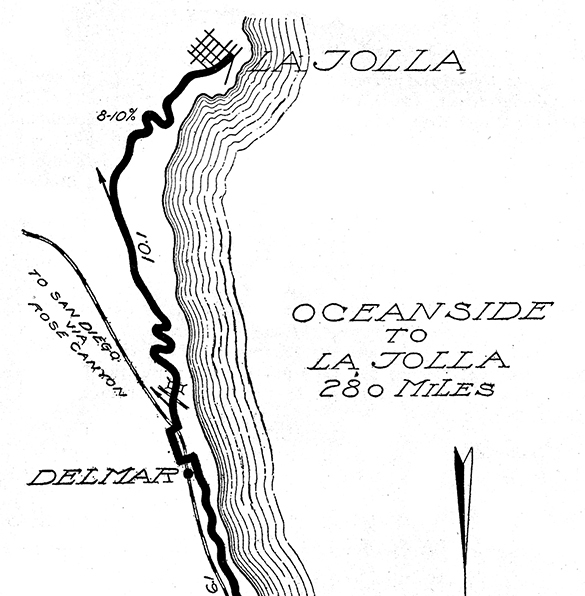 NOTES: Unlike the other three maps, this map shows the La Jolla grade. The bottom of the Torrey Pine Grade seems to head west to the coast here, and the railroad undercrossing south of Del Mar is clearly labeled. This book recommends a path from San Diego that passes through Point Loma, Ocean Beach, and Mission Beach, rather than the usual path through Old Town, Morena, and Pacific Beach. The next four maps are all interesting maps fro.m 1914. The first map is a clip from page 126 of the Fireman's Fund Insurance Company Automobile Tour Book of California. It is dated 1914, but this is actually on a small strip covering a 1913 date. The map in the 1918 edition of the Tour Book is identical to this one. Click for larger image. NOTES: The route via Rose Canyon is merely indicated at both ends, not shown in detail. The La Jolla and Torrey Pines grades are shown. The route discussed above to the village of Miramar is indicated with a note. 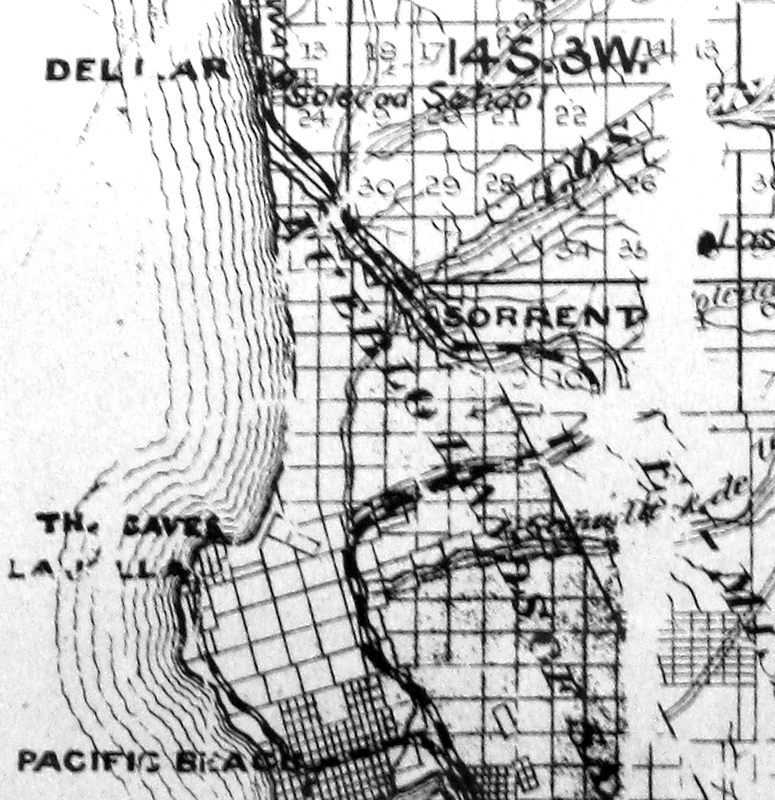 This is the first map to clearly indicate that the road passed under the rail line south of Del Mar. The railroad was on a very large berm at this point. An undercrossing still exists at this location, and is referred to as the McGonigle Road bridge: 32.935402, -117.258386. The next map is a clip of page 36 from Hamilton's Illustrated Auto Road Map California Tour Book (Fifth edition, 1914). The scale is off on these maps, but they make up for in a lot of added detail. Click for larger image. An "M" is shown at one mile intervals. Complex curves exist just east of downtown La Jolla. This can be seen in some other maps. The complexity of the La Jolla and Torrey Pines grades are indicated along with percent gradients. 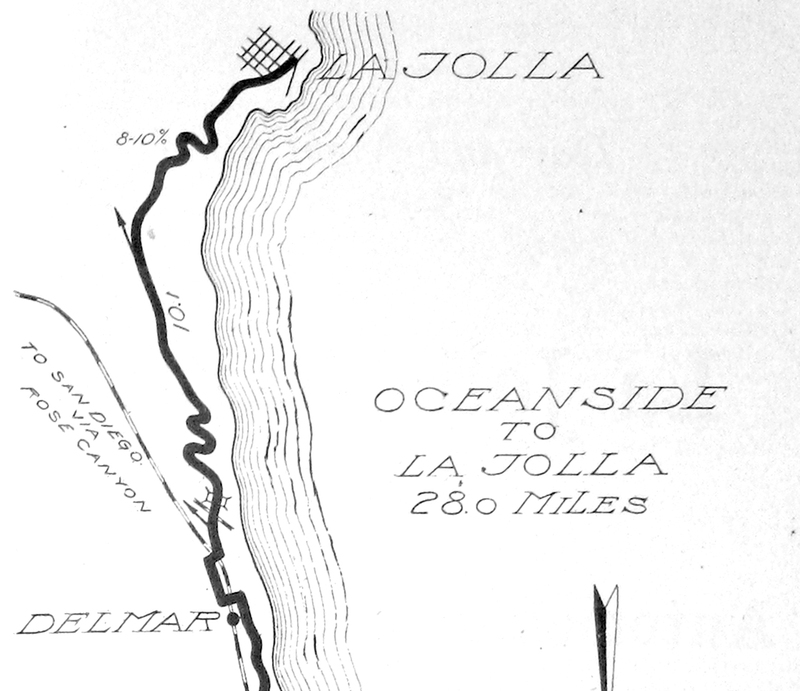 La Jolla Junction is shown as a multi-point intersection, which is also shown on topographic maps. A picture of diamond shaped ACSC signs is shown for the junction. The bridge over Los Peñasquitos Creek and the undercrossing at the rail line are shown. Oddly, a second crossing of the rail line is shown before reaching Del Mar. This should be the same rail line, so I couldn't see a a reason why it would cross twice to the east side of the line. I thought it was an error, one left over from the older rail alignment shown on the 1903 topographic map. However, the following maps show two rail lines! The last two maps are from a very interesting book called 1914–1915 Panoramic Automobile Road Map and Tourist Guide Book of Southern California. The book features an El Camino Real guide post bell on the cover, and there is a hole where a glass marble once existed. The actual book date is 1914, but it's for the 1914–1915 season. The maps are drawings, but are like angled aerial photos. Airplanes are shown flying over many of the maps. 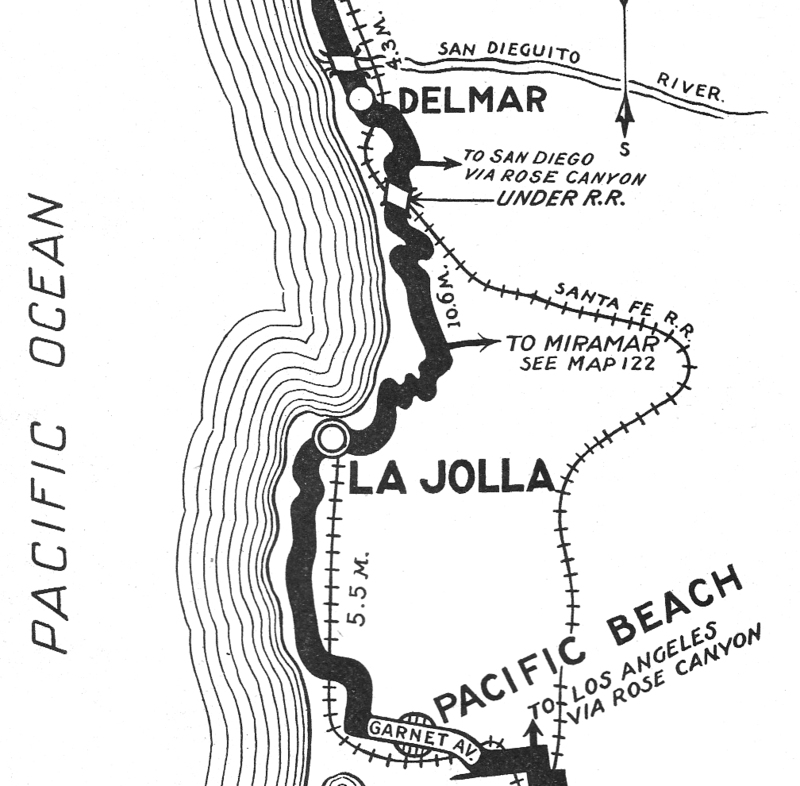 The first map shows the Coast Route from La Jolla to Del Mar. The La Jolla sea caves are featured. 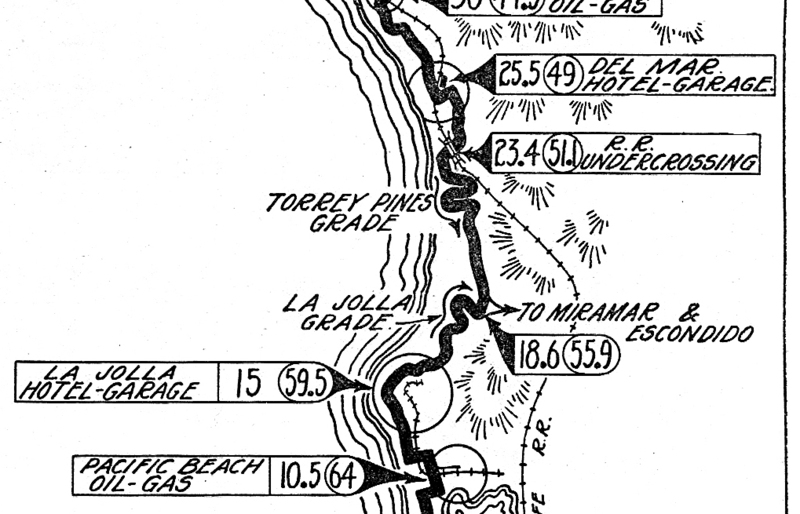 The La Jolla and Torrey Pines grades are shown with their topography. The creek bridge and rail undercrossing are shown. After a winding ascent of the Del Mar terrace, a second rail crossing to the east of a second set of tracks occurs before reaching Del Mar. La Jolla Junction is not shown on this map, but is on the next one. Click for larger image. The second map shows the Rose Canyon ECR route. The ascent to, and descent from, La Jolla Junction is not really shown. Instead, the road seems to continue through a valley. Topographically this is impossible. There is a path that avoids the main La Jolla junction, but by not more than about 0.25 miles to the east. This can be seen in the 1940s topo. 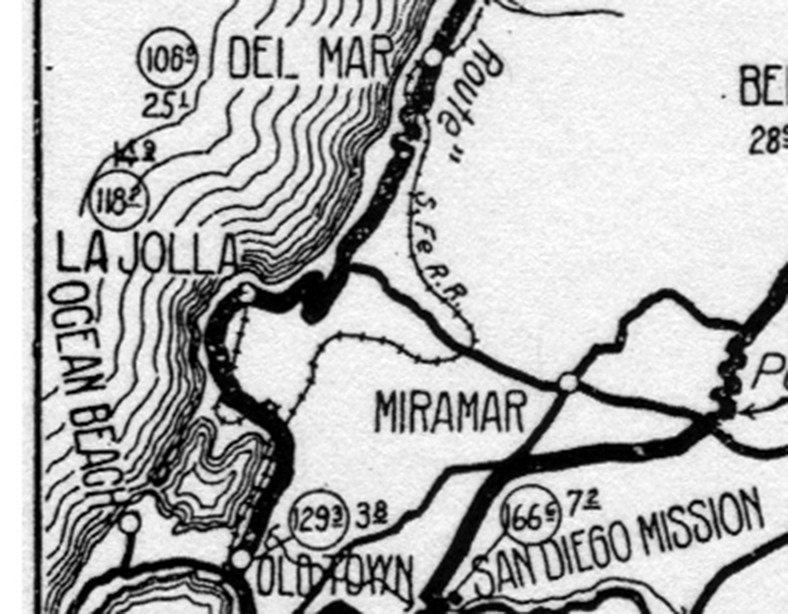 The road to Miramar is shown heading east from La Jolla Junction. This route is not even shown on the previous map! Click for larger image. The next three map clips are all from 1912. The first map clip is from the 1912 American Automobile Association (AAA) strip map No. 65. These were produced by famous auto trail pathfinder Anton Westgard. He was also head of transcontinental mapping. The map is at a 1:250000 scale, and the cartographer's initials are G.W.A. Click for larger image. NOTES: This map seems to be the first one where the cartography and scale are fairly precise. The hotel in La Jolla is likely either the La Jolla Park Hotel (1893) or the Hotel Cabrillo (1908), which became part of the historic La Valencia Hotel. The cave store was built between 1902–1912 by Prof. Gustav Schultz. La Jolla Junction is shown at mile 17.7 with the road to Sorrento shown heading northeast. Before this point, the La Jolla (or Biological) grade is shown. There appears to be a difference in the Torrey Pines Grade from earlier maps, and the 1903 topographic map. The road that descends the grade now appears to head west toward the beach rather than east to connect with the Rose Canyon road (Sorrento Valley Road). The road goes almost straight west, then bends 90° north and crosses a bridge, and almost immediately afterward passes under the rail line. Photos of the bridge, the undercrossing, and a discussion of this road can be found on the Del Mar Sandpiper website: "Once there was a wooden bridge." The website says this bridge was built in 1915, but I think this 1912 map shows the same bridge. According to the article, it was good roads activist Ed Fletcher and E.W. Scripps who built the bridge and the Torrey Pines grade. At mile 22.9 the road climbs up Del Mar terrace. There seems to be a sharp right turn inland on top of the terrace. The historic Stratford Inn (now L'Auberge Del mar) is shown. This hotel had a large tudor hotel building on the northwest corner of 15th Street and Grand Avenue, now the south section of Camino del Mar. Camino del Mar did not continue north of 15th. Instead, after passing the hotel, Grand Avenue curved sharply east then west is two switchbacks. After meeting the rail line, it continued northward. A section of old Grand Avenue still exists near the tracks today. However, the coast highway jogged west on 15th, and crossed the rail line on Coast Blvd at a grade crossing that still exists. The next map is a clip from an unnumbered ACSC strip map entitled "El Camino Real and Popular Automobile Routes to and from Famous Missions South of Los Angeles, Cal." 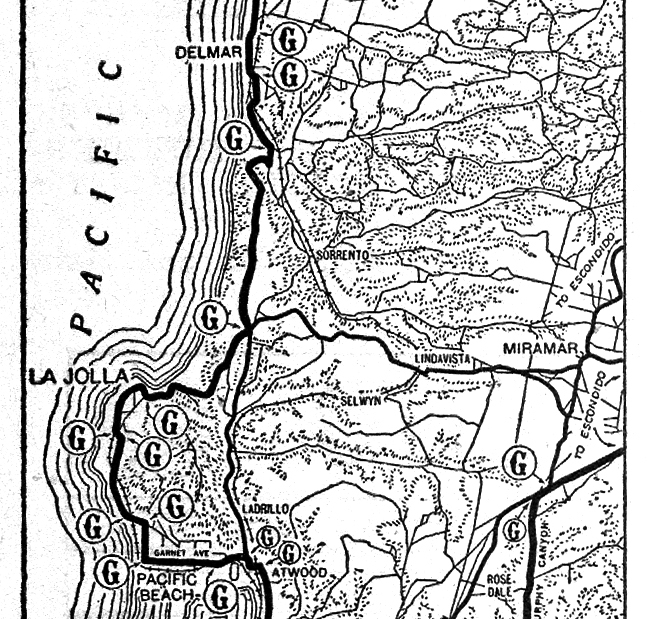 This map, and two others for the northern and central sections of El Camino Real, appeared in the June 1912 ACSC Touring Topics article "Among the Missions on the King's Highway." I consider the maps from this article, and the 1915 "Famous Missions" strip maps, to be the standard for what the Automobile Club considered to be El Camino Real. How close it adheres to the route researched by the El Camino Real Association's route committee is uncertain. Click for larger image. 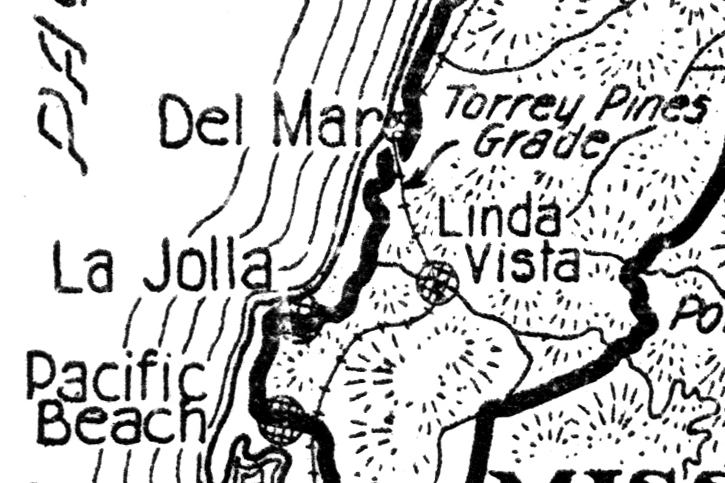 NOTES: This map shows both the Coast Route and the Inland Route (going up the older Poway Grade, today on M.C.A.S. Miramar property). There's not much detail here, but the road is obviously using the la Jolla and Torrey Pines grades. A road connects the Coast and Inland routes where the rail line goes through a deep bend. Today, this route is Eastgate Mall and Miramar Road. The point where this road crossed the rail line was called "Lindavista." Today it is called Miramar siding (32.875796, -117.174833). The last map is an early ACSC strip map, No. 78, entitled "Automobile Routes between Los Angeles and San Diego and Connecting Roads." It's pretty large scale, since it shows the whole L.A to San Diego route on one card. The Coast and Inland routes are shown with a bold line. This map is nearly identical in detail to the map above. The road name seen in quotation marks is 'San Diego "Coast Route".' Click for larger image. The next three maps are from 1911 and 1912 auto club tour books. The cartography at the two auto clubs had not reached their later exceptional level. The roads are too wide, and very little other detail is shown to provide reference points. The first map is from the ACSC 1911 Tour Book (p. 455). It shows the road from Del Mar south to La Jolla. (South is up.) Click for larger image. NOTES: Here, for the first time we see the two steep grades. The La Jolla or Biological Grade is shown as a 8–10% grade near La Jolla. This grade is today at the Scripps Institute of Oceanography. The other grade, lower on the map, is the Torrey Pines Grade. This still exists for the most part, and is the road to Torrey Pines State Park. Once again, we see a bridge symbol at Los Peñasquitos Creek, and the two railroad crossings before reaching Del Mar at the bottom of the map. A road is shown heading south (up) between the two grades. This is evidently what was later called La Jolla Junction. That road would later become the main route of the Coast Highway and US 101 (Gilman Drive). Another road is shown heading south between the bridge and the rail line. It is marked "TO SAN DIEGO VIA ROSE CANYON." This route is shown below. Click for larger image. NOTES: This route is what I believe was considered El Camino Real by Mrs. Forbes. 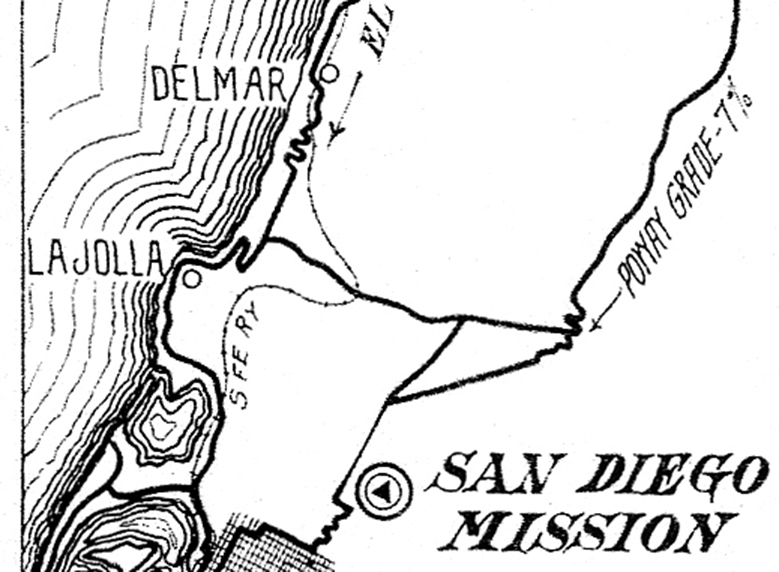 I think the actual, practical inland route, still known as El Camino Real today, branched off before reaching Del Mar, and was shown on the 1898 era map. The 1903 topographic map confirms the existence of the 1898 road. I will show it on the 1930 topo map below. After passing through Old Town (across the tracks from North San Diego), the road heads north (down) past Mission Bay (False Bay) to a crossing approximately at Glendora Street in the Pacific Beach area. The road near Mission Bay that says "TO LA JOLLA" is Garnet Avenue. The road continues north (down) through Rose Canyon approximately where I-5 is located today. The road then departs from the rail line and climbs up a canyon that is today Gilman Drive. The road meets the road to La Jolla at La Jolla Junct.ion mentioned above (32.874610, -117.237810). Then the road heads back down another canyon to Sorrento (32.901075, -117.223525). The eastern section of this road is the path of I-5 today, but part of this old road still exists today in an isolated canyon (32.885397, -117.234351).The road then crossed the rail line twice before meeting the Coast Highway route near Los Peñasquitos Creek, probably near Carmel Valley Road (approximately: 32.932074, -117.251010). Part of the old road still exists, and is now used as a recreation path. The first rail crossing was here: 32.919398, -117.239479, and the second was about here: 32.930706, -117.245522. The third map is from the 1912 California State Automobile Association Tour Book. I'm presenting for completeness, because as can be seen, it is essentially identical to the 1911 ACSC map. Click for larger image. 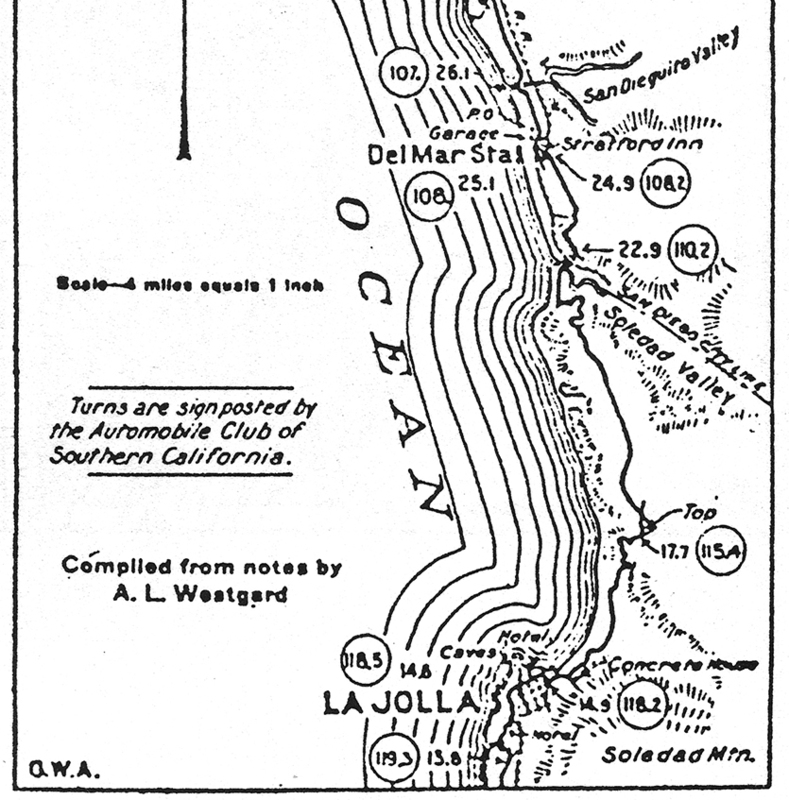 The next map is from the 1909 Automobile Club of Southern California (ACSC) Tour Book (p. 245). As far as I'm aware, this is one of the earliest, if not the first, tour book produced by the auto club. There isn't a lot of detail here, but what it does show is a main road going from La Jolla directly to Del Mar. Click for larger image. NOTES: There is no detail for the La Jolla or Torrey Pines grades. A bridge is shown for the Los Peñasquitos Creek crossing. There are several railroad crossings before and after Del Mar. 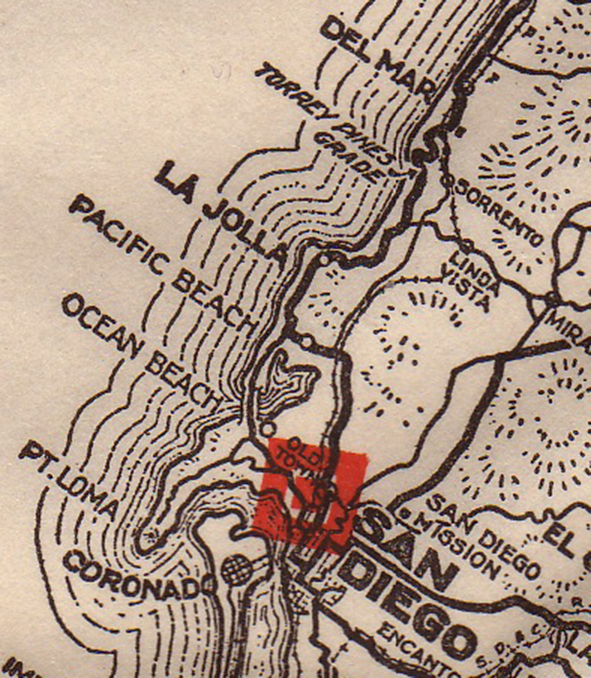 This first map is a circa 1898 official San Diego County map. The La Jolla area was part of the former San Diego mission lands (San Diego Pueblo), and was called Ex Mission. Click for larger image. NOTES: The railroads seem to be shown with black and white striping. I believe the double line paths are the roads. Rail lines exist to La Jolla and up Rose Canyon. The La Jolla line was the San Diego, Pacific Beach & La Jolla Railway. The main tracks going north through Rose Canyon are the Santa Fe railroad. No continuous road seems to pass through La Jolla. The Rose Canyon road parallels the Santa Fe, and has several branches heading east. The big loop has a short cut road that is likely ECR. There is a major junction at Sorrento Siding, where a road heads northeast through Los Peñasquitos Rancho lands. A road that is evidently ECR continues northwest along the tracks, then heads north along the township line about 1.25 miles east of Del Mar. This road continues north to "San Dieguito" site off the map to the north. The actual route of El Camino Real as defined by the El Camino Real Association in the first decade of the 20th century is a bit hard to pin down. Mrs. Harrie Forbes (creator of the ECR bells) in her book California Missions and Landmarks: El Camino Real says that the ECR went through Rose Canyon, not around through Pacific Beach and La Jolla. However, all auto club route books and strip maps show this coast route path as the main traveled road. This thread examines the maps and possible route of the ECR and the early coast route, circa 1900-1920. The map below is from the 1947 USGS 15-minute Ash Fork quadrangle. These is are the maps from the 1923 Automobile Club of Southern California NOTR guide and from individual strip map cards for the early to mid 1920s. This is ACSC map #231 from Williams, Arizona to Seligman. This is ACSC map #230 from Seligman, Arizona to Peach Springs. This is ACSC map #229 from Peach Springs, Arizona to Kingman. These maps are from Locke's Good Road Maps of Local and Transcontinental Automobile Routes by Harry Locke. Flagstaff to Ash Fork, 1917. Ash Fork to Seligman, 1918. Seligman to Peach Springs, 1918. Peach Springs to Kingman, no date — circa 1918. This is NOTR map #231 for Williams to Seligman from the 1915 Automobile Club of Southern California NOTR guide. This is NOTR map #230 for Seligman to Peach Springs from the 1915 Automobile Club of Southern California NOTR guide. This is NOTR map #229 for Peach Springs to Kingman from the 1915 Automobile Club of Southern California NOTR guide. This discussion will be on the NOTR alignments between Williams, Arizona and Kingman to the west.